In today’s post, I’ll briefly discuss issues related to the so-called ethanol “blend wall” that I discussed in the EBI presentation. As has been widely reported, the blend wall represents a somewhat artificial (yet real) limit on the amount of ethanol that can be blended into the U.S. gasoline pool. This limit, which is roughly 10% of the total volume of gasoline-based fuel sold in the U.S., arises largely because until recently, EPA regulations did not allow the blending of concentrations of ethanol greater than 10% into gasoline for use with conventional motor vehicles. Higher blends of ethanol, particularly E85 (85% ethanol, 15% gasoline) are sold for use in specialized “flex-fuel” vehicles that are designed to utilize such blends, but these vehicles comprise only a very small share of the U.S. automobile fleet. Almost all the gasoline sold in the U.S. today includes 10% ethanol (E10), for use with automobiles, light trucks, as well as motors on boats, lawn mowers, snowmobiles, etc. The blend wall poses a challenge to compliance with the U.S. Renewable Fuel Standard, since the yearly-escalating volume mandates under the RFS cannot be met in the short term without the use of amounts of ethanol that well exceed the blend wall limits. EPA is responsible for setting limits on the amounts of ethanol in gasoline, under its responsibilities under the Clean Air Act. In 2010 and 2011, EPA announced that it had granted waivers under the Act to allow ethanol blends of up to 15% (E15) to be used in all cars and light trucks of model year 2001 or later. However, E15 was not allowed to be used in older cars and in other motors, so that EPA’s regulations allowing the sale of E15 additionally included some requirements aimed at preventing misfueling of E15 into vehicles or motors for which it was not permitted. See my January 11, 2013 posts on Biofuel Policy Watch and Advanced Biotechnology for Biofuels for more details about E15. In spite of EPA’s action, adoption of E15 around the country has been slow, for a variety of reasons. Some of these are quite legitimate: in order to sell E15 along with E10 (and in some cases also E85), gas stations may need to retrofit their gasoline pumps to offer the different blends, and may also need to install new tanks or piping to accommodate the increased corrosiveness of the higher ethanol blends. Along with the labeling requirements of EPA’s regulations and other factors, the needed infrastructure changes to individual gasoline stations can be extensive and expensive. Furthermore, many states also regulate their gasoline supplies and had existing laws or regulations that placed the blend limit at 10% — those states would need to explicitly authorize the use of higher blends, often through legislative action. Beyond these legitimate barriers, the acceptance of E15 has been hindered by the lobbying and (quite frankly) misinformation efforts of various parties opposed to the use of E15. Although EPA’s action to approve E15 was based on the results of extensive engine tests showing that the fuel can be used safely, opponents have funded and widely publicized studies purporting to show that E15 damages engines. The resulting publicity has cast doubt on the safety of E15, including concerns over whether use of E15 might invalidate the warranties on engines. So, as long as E15 struggles to gain acceptance, the blend wall of 10% remains a reality, thus causing the conflict with the obligations under the Renewable Fuel Standard. During my talk, I made several suggestions for policies that might promote the use of higher ethanol blends, to help break through the blend wall. These included the following. Adopt state legislation to guarantee that E15 can be sold; block state bills that would prohibit sale of blends greater than E10. There has been a fair amount of state legislative attention directed at E15 in recent years, some of which I’ve discussed in earlier entries on this blog (for example, my posts of May 23, 2013 and February 27, 2014). According to recent news reports, there are now 14 states which allow E15 to be sold, although in many of these states there are very few gas stations yet selling this fuel. On the other hand, the last 18 months or so have seen a flurry of activity in state legislatures that were considering bills to prevent the sale of ethanol blends greater than 10% — please see the May 23, 2013 post and others preceding it on the blog for summaries of activities in 2013, particularly in some of the New England states. The biofuel industry has lobbied hard against these bills, and has successfully defeated or neutralized most of them, but in general the bills that have passed impose limits that would only go into effect in that state if a specified number of neighboring states adopted similar bans. Among more recent (winter-spring 2014) activities and developments in state legislatures are the following. In Missouri, a law was scheduled to go into effect at the end of May, allowing E15 to be sold in the state. According to press reports, Missouri will become the 13th state to allow E15 to be sold. However, as reported elsewhere, the law generated some controversy from groups opposed to the use of higher ethanol blends. The first gasoline station to offer E15 in Ohio opened in late May, making Ohio the 14th state in which E15 is commercially available. In Iowa, Governor Branstad signed a bill on May 21, 2014 that promotes biofuel usage in several ways, including extending the state’s biodiesel production tax credit, and enhancing the retailer tax credit for gasoline sellers who want to offer E15 during the summer driving season. In New Hampshire, the state House passed House Bill 1220, which would limit the use of corn-based ethanol to 10 percent of the fuel mix used in New Hampshire, but only if two other New England states adopt similar legislation. However, on May 15, 2014, the State Senate voted to send the bill to an interim study, which effectively kills the bill for the current legislative year. 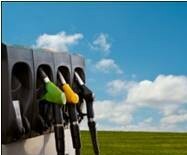 Adopt policies mandating use of alternative fuels and high ethanol blends in captive government fleets. One potentially powerful strategy available to federal, state and local governments would be to adopt policies mandating or favoring the use of higher ethanol blends in captive government fleets: the cars and trucks used by government agencies for internal purposes, as well as mail delivery vehicles and other motor vehicle fleets owned and operated by governments. There are a handful of examples of this (e.g. see the South Dakota news report mentioned above), but to my knowledge such policies are not common, but more widespread adoption of such policies could go a long way towards creating a market for E15 as well as E85 and the flex-fuel vehicles that can utilize E85. Education and consumer communication about the safety and utility of higher ethanol blends. The efforts by those interest groups opposed to biofuel adoption have been successful in sowing doubt about whether E15 can safely be used in most automobile engines. Rigorous studies have been done establishing safety, but it has been hard for the industry to publicize and disseminate these results against the tide of misinformation coming from the opponents. Ethanol and biofuel advocacy groups are doing what they can: among other activities, the Renewable Fuels Association maintains a webpage promoting E15, and the American Coalition for Ethanol recently issued a press release aimed at E15 education for the public. However, these efforts need to be broadened and intensified, and ideally should be joined by the government agencies whose studies have shown efficacy and safety, and which maintain regulation promoting or authorizing use of higher ethanol blends. That being said, I know this is not an easy task, and that the efforts of many stakeholders will be needed. Promoting infrastructure upgrades. As mentioned above, the most important tangible barrier to the acceptance of higher ethanol blends is the need for costly infrastructure improvements at gasoline stations around the country. Governments at all levels should adopt programs that allow, encourage or support the infrastructure upgrades that are needed for E15, E85 and other high ethanol blends, by providing grants, tax breaks and other types of assistance for retailers to improve infrastructure. Some efforts along these lines have taken place, but more are needed.